Also Called: Dwarf flameflower, prairie flameflower. Stems: More or less erect, simple or branching, short. Leaves: Alternate or nearly opposite, sessile, fleshy, circular in cross section, linear, 3/5 to 2 inches long, less than 1/10 inch thick; bases slightly broadened. Inflorescences: Cymes, terminal, bracted; flowering stalks slender, 1.2 to 6 inches long. Flowers: Showy, usually stalked but sometimes nearly sessile; sepals 2, distinct and free, egg-shaped, 1/8 to 1/6 inch long, deciduous or sometimes persistent, tip sometimes purplish; petals 5, pale pink to purplish, elliptic to eg-shaped, about 1/4 inch long; stamens 4-8; style longer than stamens; stigma head-like. Fruits: Capsules, ellipsoid, 1/8 to 1/5 inch long; seeds many, smooth, flattened, roundish. 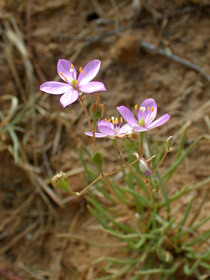 Habitat: Bare sandy, acidic soils overlying rocks. Uses: The Navajo steeped the roots to make a lotion and applied a poultice of root bark to sores. Comments: The flowers open late afternoon, evening or when overcast. See also Rockpink Phemeranthus calycinus.